Christmas Island (Kiritimati) is a destination that inspires adventure, and it is a mecca for anglers around the world. The fishing on Christmas Island is like no other saltwater destination on the planet, with nearly two dozen different species of fish to catch. Located 1200 mil,es south of Honolulu and 120 miles north of the equator, Christmas Island has stable weather and fishing conditions year-round. With more that 240 square miles of hard sand and coral pancake flats inside the lagoon, you never have to fish the same flat twice. Except for fishing the blue water, all the fishing on Christmas Island is done while wading the flats. Many of the named flats–Orvis, Paris Texas, Nine Mile, Y Site–are legendary, and they seem like they are endless. There are many others called “pancake flats,” as most of them are roundish in shape and seem to erupt off the bottom of the lagoon, making perfect reefs for fish and fishermen. Christmas Island offers arguably the best fishing for bonefish in the world. Experienced saltwater anglers can land 100 bonefish in a week, and 10-12 per day is a good average. It is rare to cast farther than 40 feet to these fish, and they are usually very eager to eat your offering. Typically, the bonefish on Christmas Island travel as singles or doubles and average three pounds. Bones in the four- to six-pound range are very common, you’ll occasionally see fish up to ten pounds–though these bones are seldom landed. 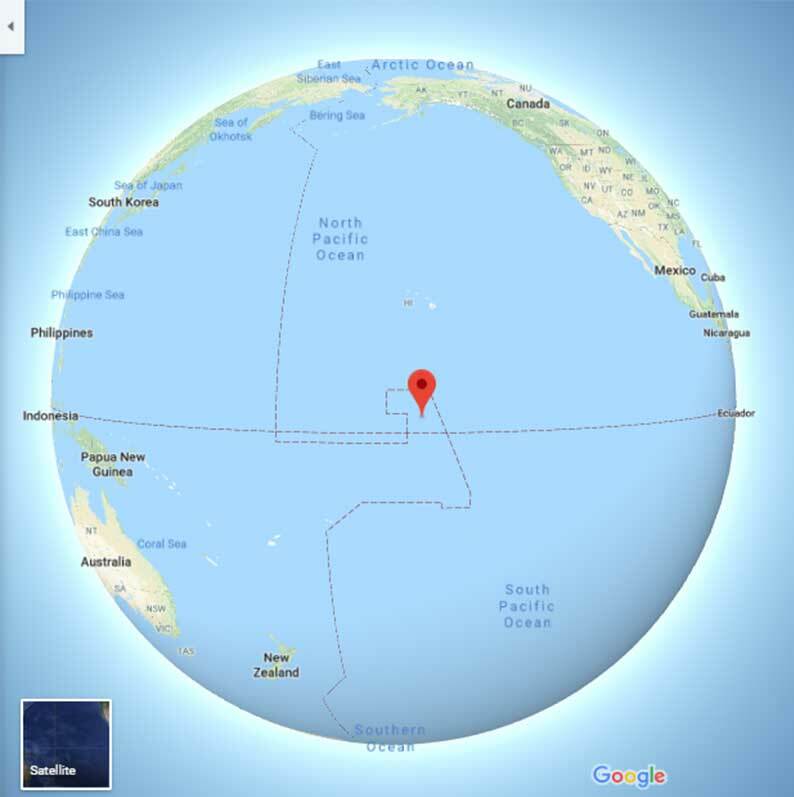 Kiritimati is along way from anywhere, in the middle of the Pacific Ocean. 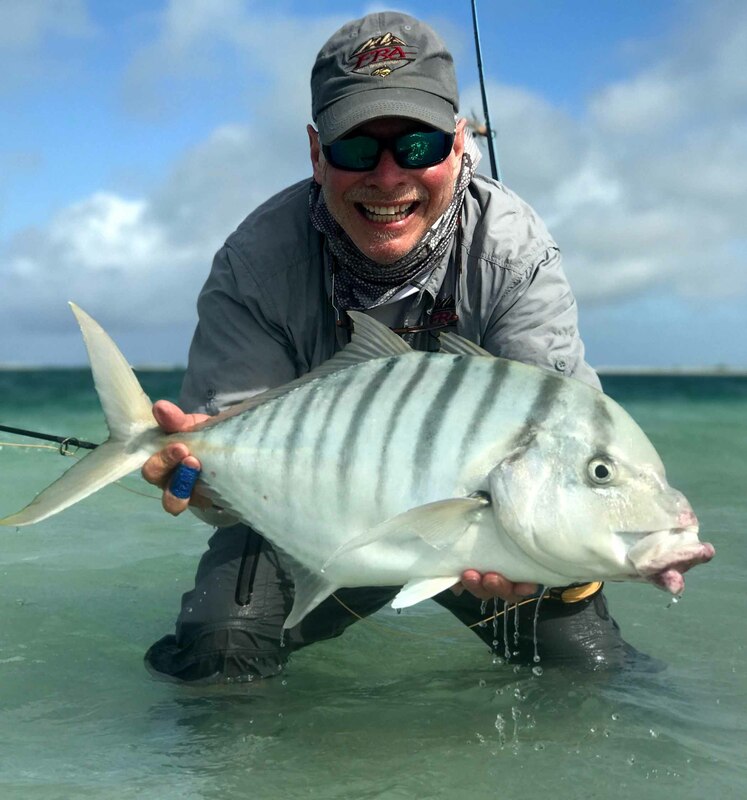 Triggerfish offer another fantastic flats-fishing experience, and there are several different species to target on the flats of Christmas Island: titan triggerfish (also known as Mustachios), yellow margin triggerfish, peach face triggerfish, and Picasso triggerfish. With their hook-crushing teeth, landing one is a feat in and of itself. If you can get one to eat your fly without crushing the hook, keeping it from making it back to its hole is the most important step in landing a triggerfish. If everything comes together, you’ll be rewarded with one of the prettiest and most rewarding fish on the flats. Bluefin trevally, bar jacks (trevally), and golden trevally are all found on the flats, as well. They can be found on the edges of the flats sometimes, even mixed with bonefish or milkfish schools. Bluefins and bar jacks are usually extremely aggressive and will chase a well or a very misplaced fly and smash it aggressively. They tend to like smaller, flashier bonefish patterns. While goldens are much rarer, they tend to behave more like a permit. Even if you see one, feeding a golden is a different deal. Lately, golden success has been on larger crabs and mantis patterns. Offshore opportunities are plentiful, as well. When offshore conditions are right, anglers can spend the morning fishing for yellowfin tuna, wahoo, sailfish, and giant trevally, then fish the flats in the afternoon. \There are also twelve- to thirty-five-pound milkfish available on outgoing tides in the morning, which put up an incredible fight. Steve McLaughlin shows off a golden trevally after a tough fight. 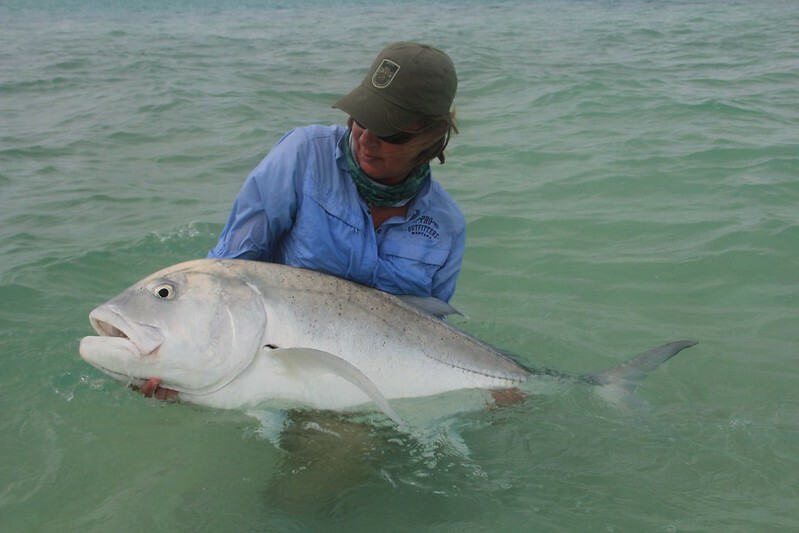 The main attraction for many of the anglers that travel to Christmas Island is the giant trevally (GT). Christmas Island offers the best, affordable, closest-to-home opportunities for anglers to try for a monster GT. Weighing in at up 100 pounds, GTs are the apex predator on the flats. Many times, they appear out of nowhere, charging onto and though the flats with lightning speed. It’s not uncommon to see one with its entire back out of the water, chasing bonefish, mullet, snapper, and milkfish in extremely shallow water, with baitfish flying everywhere! GTs come in many sizes. The five- to fifteen-pound “baby” GTs can be tremendous fun, as they almost always are in schools, chasing baitfish and throwing all caution to the wind. These smaller fish can be a blast on an 8- or 9-weight rig. But most GT fishing is done with a special 11- or 12-weight setup. The perfect rigging for these big Gangsters would be an 11-weight Helios 3 with a Mirage V spooled with 400 yards of braid backing and a Scientific Anglers GT 475-grain line, finished with a straight nine-foot, 100-pound fluorocarbon leader. You never quite know what size GT will be cruising through! When they are terrorizing the flats, GTs feed on anything that gets in their way. This is the best opportunity for anglers to present their offering and hook up. If there is no action on the flats, blind-casting poppers into the channels on the side of a flat can be a great way to create action. Often if one angler is throwing a popper, it is a good idea for a second angler to cast a GT streamer in the same area. When GTs come in to chase the popper, the second angler can cast the streamer toward the popper with a high chance of both anglers hooking up. Giant trevally are known for their fierce fighting abilities, and for finding ways to break an angler’s tackle. The backcountry fishing is something that all anglers who fish Christmas Island should try to experience. The backcountry is a mixture of sea-shell-lined beaches, channels, and short flats that has been fished by truck, historically, but they are accessible by boat on proper high tides. In the backcountry you’ll encounter GTs, bonefish, triggers, and goldens. This area is very close to nearly landlocked milkfish ponds in the middle of the atoll. The milkfish are raised as a source of protein for the islanders. On higher tides the ponds tend to over flow, which allows milkfish to escape and GTs to get in. This can create interesting stealth-fishing scenarios for anglers who get the chance to get to the backcountry. For more information on fishing Christmas Island, visit Front Range Anglers’ Adventure Travel Page. For their April 2nd-9th hosted trip, Front Range Anglers have partnered with Orvis, and each angler will receive an Orvis H3 Rod of their choice for use on this trip.